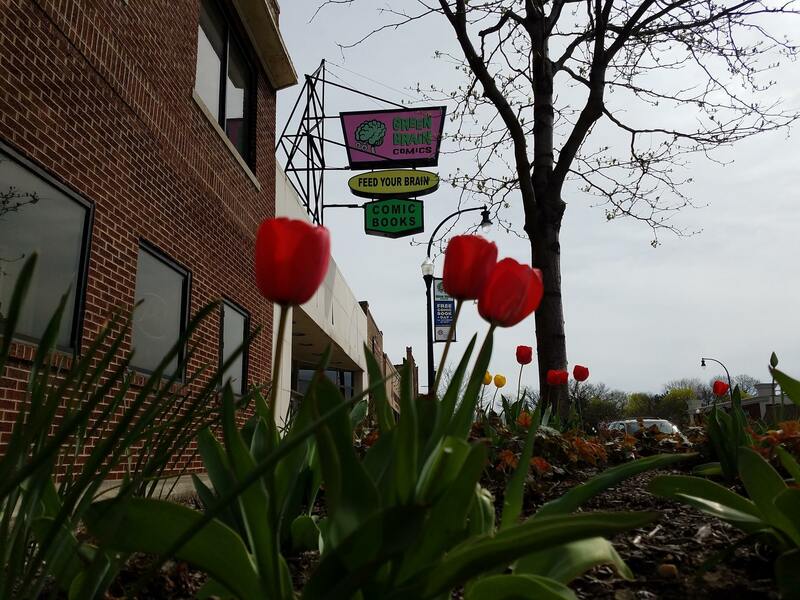 CBLDF’s work is possible because of our members, which include comics retailers such as Katie and Dan Merritt of Green Brain Comics in Dearborn, Michigan. For the latest issue of CBLDF Defender, we grabbed a moment with Dan and Katie to talk about the importance of comics and why they value CBLDF’s mission. You’re both lifelong comic book readers. What do you find so appealing about the format? Dan: As far back as I can remember, there have been comics in my life. From newspaper strips, to Peanuts digests, to piles of comics that my Mom picked up from rummage sales. And those early memories are strongest when the stories were the most immersive. From the super compressed Carl Barks’ Duck stories, the fast paced Tintin adventures, to the wild, hypnogogic Doctor Strange comics by Steve Ditko. Each of those pulled me into the world, the story, and the underlying themes. Comic books have always opened my mind to possibilities, not only in the story, and character, but most excitingly, in style. Matt Madden’s fine book 99 Ways to Tell a Story: Exercises in Style is a phenomenal examination of that idea. And while many comic books are mired in specific genres, they are never restrained in how to tell those stories. Katie: My story is pretty much the same with different examples. From my Dad reading me the Sunday funnies to checking out Viva Mad by Sergio Aragones from the library, to Harvey Comics at Grandma’s house, I loved comics before I even knew the scope of what that meant. At 18, when I got the job at a comic shop I discovered Love and Rockets, Sandman, and Yummy Fur, and my life was never the same. Something about the combination of words and pictures just clicks more than books or movies ever could alone. Comics have the ability to tell any kind of story, there is no special effects budget and the outrageousness of a story is only limited by the writer’s imagination. One of your goals as retailers is “to provide a comic book store that has something for everybody.” How do you accomplish this? We accomplish this through our diverse selection. We believe comics are more than superheroes and maintain a wide variety of titles for every age and taste including non-traditional GNs like biographies and nonfiction. Green Brain Comics also supports self-published, locally made comics and GNs. Being open and supportive to all requests and tastes means customers never have to worry about asking for something odd or unexpected. 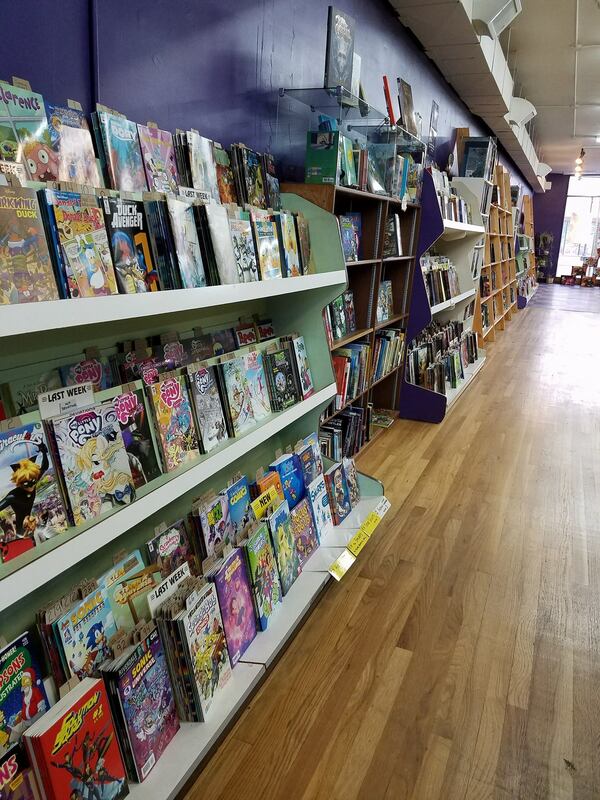 Our product mix is almost 100% comics and graphic novels. The store has an expansive 3,000-square-foot sales floor that is almost all comics. 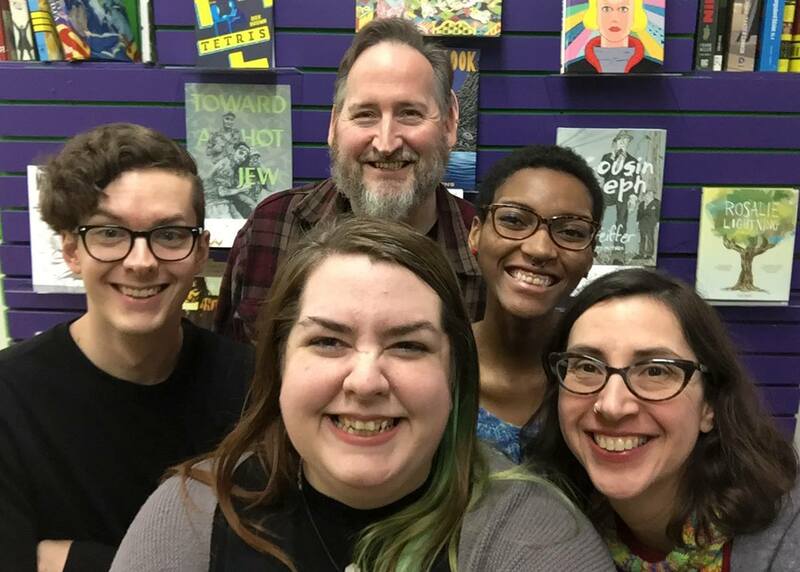 We realized a long time ago that we needed to focus on what we do best, and that has manifest in the biggest, most diverse selection of new comics and graphic novels in the state. Two comics — This One Summer by Jillian and Mariko Tamaki and Drama by Raina Telgemeier — topped the American Library Association’s list of the most challenged books in 2016. Why do you think comics are targeted by censors, and how do you counter misconceptions about comics? By the nature of comics, they are very easy to bookmark and then point to a page that contains a depiction that the reader may not agree with. And it’s far more challenging to point to a similar passage described in prose. Pictures are a shorthand that can quickly stir emotions and concerns. Both This One Summer and Drama touch on subjects that parents or community leaders are afraid will influence young readers with ideas or behavior that are contradictory to their values. We believe a parent should have an interest and knowledge in what their own kids are reading, but not an influence on what others choose for themselves. We always encourage parents to let kids read what they are interested in (within age appropriateness, we actually see more of the reverse with kids wanting to read mature or explicit titles). In the past, you’ve participated in Children’s Book Week, Banned Books Week, and other events to promote comics. What do you have in store for this year’s celebration of the right to read? Our prominent displays of challenged books are great conversation starters. Many patrons are surprised that a classic like Jeff Smith’s Bone is included, and become very receptive to the wider range of challenges from that entry point. We are looking to focus on a few of the frequently challenged graphic novels for our September Book Club meeting. This would be a great way to introduce readers to comics they may have not yet discovered, as well as the concept of challenged books and what the CBLDF does. You have been long-time supporters of CBLDF. 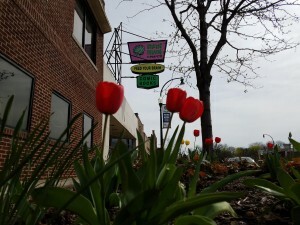 Why is CBLDF’s mission important to you? Katie: We believe access to books, comics or otherwise, is essential for a free thinking society. The CBLDF’s missions of protecting that access, and those who supply that access, is a noble and necessary service to society. And we applaud them at every chance for providing that service. Dan: As comic retailers, we appreciate the hard work of the CBLDF, and what they stand for. We share the belief that everyone should have reasonable access to information, in comics, books, journalism, and the internet. And the people that create content should have the freedom to bring their work to market without restriction, or fear of censorship. Our society is built on these fundamentals, and we take comfort that the CBLDF is there to defend our First Amendment rights. All of us at Green Brain Comics appreciate the leadership role that Executive Director Charles Brownstein and the rest of the staff have taken in education, consultation, and collaboration to educate everyone on their right to read. Our thanks to Dan & Katie and all of the retailers who support our mission to protect the freedom to read comics! You can also help support CBLDF’s important First Amendment work by visiting the Rewards Zone, making a donation, or becoming a member of CBLDF!